This article originally ran as an introduction to the Remote Viewing Systems comparison chart in the May 2017 issue. The chart can be viewed here. The implementation of electronic health records (EHR) has created an expectation that all patient data, including images, should be available in one location. Today, reports describing images are not enough, as many referring physicians want to see the images, and many use them to help guide therapies. This has caused an increased demand to exchange medical images in the various departments of healthcare settings. The Organization for Economic Co-operation and Development (OECD) reports that North America had an increasing number of imaging procedures for computed tomography (CT) and magnetic resonance imaging (MRI). In the U.S., 76 million CT scans were performed in 2013 and 81.2 million in 2014, representing an increase of around 7 percent. This growth is also seen across the globe. Developed regions such as North America and Europe together accounted for the highest share in 2015 and are expected to maintain their leading position from 2016 to 2022, due to increase in demand for medical informatics technology and high adoption rate of technologically advanced healthcare IT systems. This is driving further demand for systems that share digital images and reports. Where in the electronic medical record (EMR) do you plan to place the viewer button? Consider how you want the viewer to launch and present imaging data. Will it launch into a specific study with the report, or should it include a list of all imaging studies for that patient? If using the viewing system for a vendor neutral archive (VNA) or enterprise implementation, consider what types of files will need to be accessed by the viewer. These may include files formatted for PDF, JPEG, XML and various video file types required by departments, and may include cardiology ECG waveforms, available light photos from dermatology, pathology or the emergency department, and video from surgery and sports medicine. Is the remote viewing system compatible with your EMR? Can data transfer bi-directionally, so the image being opened can be modified and/or edited? Does the system allow mobile device access such as a tablet or smartphone? Can referring physicians access the images outside of the EMR? Some hospitals that have installed such systems have found that the referring physicians are among the biggest users. Does the viewer use server-side processing? This can allow large datasets to be opened and manipulated on small devices such as smartphones. Does the viewer support native advanced visualization? These features can save time and reduce the need for additional logins or software. Does the system allow for both image viewing and image sharing? There is a difference between these functions. Sharing means the images and reports can be downloaded. The image viewing only allows for looking at the images and no edits or downloads can be made. How is data secured and does it meet HIPAA? Some vendors are going beyond just enabling access to images and reports and using artificial intelligence (AI) to review the study and offer additional data to speed workflow and save radiologists time. AI can pull in all relevant patient data from the electronic medical record that would be important for review of a study. AI also can pre-fetch all prior imaging studies that are relevant to the order or the anatomy being reviewed. At HIMSS 2017 in February, Agfa showed an integration of IBM’s Watson AI technology within its remote viewing system. The example they showed was a lung X-ray exam, where the AI read the order and viewed the image and determined it was a lung with a high probability of small lung cancer and evidence of prior lung resection. The AI pulled in patient history relevant to the patient smoking and prior exams and oncology records related to lung surgery, radiation therapy treatments and chest imaging for side-by-side comparison with the current exam. This was all gathered when the radiologist opened the exam and was immediately available to them. Philips Healthcare showed a similar application at HIMSS using its own adaptive intelligence developed for the Illumeo enterprise management tool. When a study is opened, the radiologist can hover over specific anatomy to open an onscreen icon menu. They can click to open reports or related studies. The AI will pull in all priors and open the datasets to the exact orientation and slice as shown in the current study. The example Philips showed was of a tumor tracking study where the priors are important for quantification of tumor size. 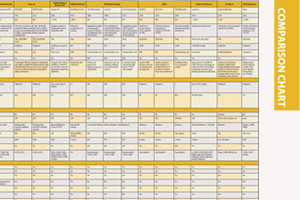 ITN has created a Remote Viewing Systems comparison chart of the specifications for these systems. This will require a login, but it is free and only takes a minute to register. The chart includes many manufacturers of Remote Viewing Systems that are available in the United States.